Folk Song Farm is embraced by 48 acres of rural Wisconsin farmland. Within view of the historic Holy Hill basilica, the Barn at Folk Song Farm is an idyllic venue for a dream-come-true wedding. For that matter, Folk Song’s Barn is the perfect setting to celebrate all of life’s greatest moments. Nestled in a rural location just 30 miles north of Milwaukee, this southern Washington County site is only minutes away from Highway 41 and I-94. Whether you decide to exchange vows surrounded by wild flowers in Folk Song’s landscaped gardens or proclaim your “I do’s” in the barn built with hundreds of hand-hewed timbers from days gone by, we’ll help you weave dreams into memories. 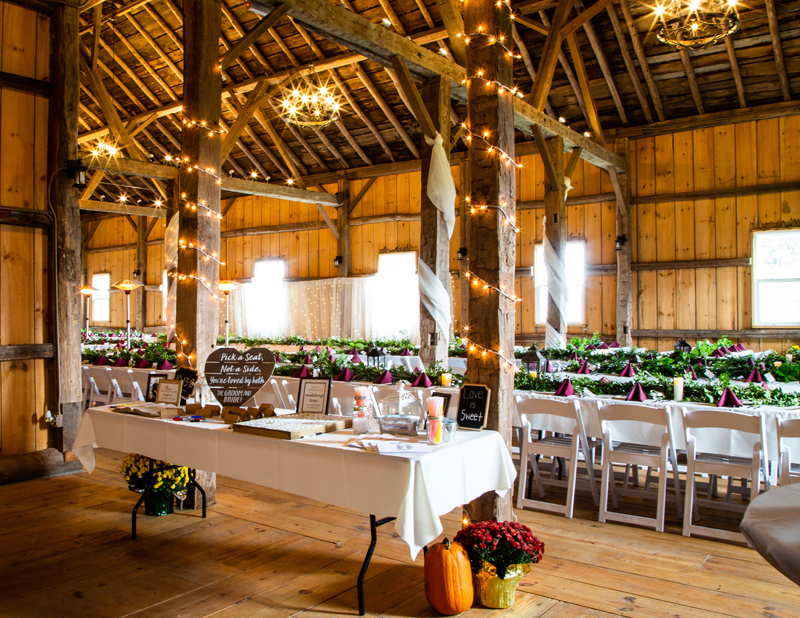 The rustic Barn comfortably seats up to 250 guests for a plated meal and over 300 for a social gathering. The Barn’s south-facing deck has breathtaking views in store for you with open farmland and awe-inspiring views of the rolling hills surrounding Holy Hill. If unforgettable is your theme, Folk Song Farm is your venue. Pre-dating the Civil War-era, the nostalgic barn offers the perfect after-dinner reception space for an extraordinary event. You’ll have all you need here – a place for music with enough room to dance, a movable bar and plenty of seating inside and out. Enhance your experience with a stylish white tent just outside the Barn – you’ll be surrounded by lush green fields and your guests can enjoy yard games or relaxed conversations in a variety of outdoor seating areas. Or perhaps they’ll prefer an evening bonfire or want to dance the night away.